I was searching for my own path for quite a while. I studied spatial development, designed furniture and did paintings on request. However, it wasn’t until I started studying interior design at Poznan School of Social Sciences when I realised I wanted to design jewellery. I spent a lot of time at my studio learning about tools and materials and perfecting my skills. Thinking in form remained, and architectural references in jewellery are ALE. trademark. I’ve created my own brand to have total artistic freedom. By sitting at the goldsmith’s table I find peace, I lock myself into the world of structures and forms, and I do what I like most – create unique forms and shapes that agree with my own aesthetic style. My designs are characterised by precision of craftsmanship and high quality. Besides architecture, I find nature and fashion an inexhaustible source of inspiration. ALE. 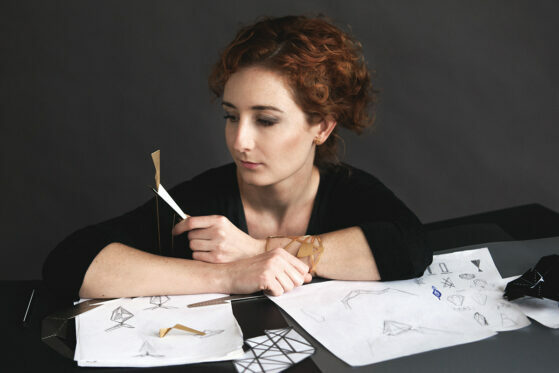 jewellery has already complimented collections of Maciej Zień, Edyta Pietrzak, Ewelina Klimczak and Magda Hasiak. Please come and visit my studio.